A full-time job at a funeral parlour is a chance at a new start for Aaron, a taciturn teen who has struggled in the school environment. His boss is caring and generous and the work, although emotionally fraught at times, is a good fit to Aaron’s nature and abilities. The rest of his life is not as easy, however. Mam seems lost in her own world most of the time, the other families in their caravan park are antagonistic and Aaron is walking in his sleep and having nightmares that seem to be leading him towards a dangerous place. I picked this book off the library shelf because of the glowing recommendation from John Marsden on its front cover. He didn’t let me down. The Dead I Know is an excellent book. It’s always such a refreshing surprise to pick up a novel aimed at the young adult market and find something that combines good writing talent with a story that goes beyond the usual fluffy fare. I enjoy that as much as the next person, but I also feel that there is a shortage of genuinely good and thoughtful literature in the YA sphere. With this offering, Scot Gardner shows that he has the talent to stand out from the trend-following crowed. 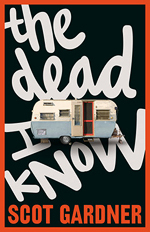 Better still, The Dead I Know is a quality novel that will actually appeal to teenage boys. The YA bookshelves tend to be dominated by plotlines aimed at girls, so it’s great to find a book that will genuinely interest their male counterparts. While the book is set in a funeral parlour, and deals with death in a very warm and accepting manner, there are plenty of moments that will make a squeamish reader shudder and thus appeal to the teen male appreciation for the utterly disgusting. Such moments never feel gratuitous, however, and I think this is due to the calm presence of funeral director (and father figure) John Barton. Barton is an excellent character and his personal subtlety mirrors the subtlety of the book itself. Indeed, despite the presence of the intense emotion of grief, despite the straightforward explanations of the physical processes that follow death, and even despite the final revelation of Aaron’s dramatic past, The Dead I Know is an extremely understated work. It gets under your skin. The prose feels languid but, at the same time, it’s difficult to put the book aside. My appreciation for it grew slowly but, by the end, I was left knowing that I had read something truly worthwhile. I would love to see The Dead I Know studied in Australian high schools. It’s so rich with themes, and the quiet style leaves a lot of room for classroom discussion of events, character motivations and outcomes. It is a coming-of-age story, in that it follows Aaron’s journey towards a greater acceptance of his past and knowledge of the man he is becoming, but it is also something more than that. I very much hope that this title will soon reach the international market.